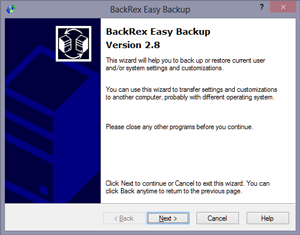 BackRex Easy Backup is a powerful settings backup and migration tool allowing you to backup your current Windows configuration to be restored later or transferred to another machine or the same machine under another OS environment. Among the settings being backed up are desktop layout, mouse cursors schemes, sound schemes, regional settings, etc. BackRex Easy Backup will also save customizations of Microsoft Office XP/2003/2007/2010/2013 suite, Outlook data folders, e-mail, contacts, tasks, Win7/Vista Windows Mail, Outlook Express, Internet Explorer and Mozilla Firefox settings including personal address books, mail folders, dial-up settings and much more. 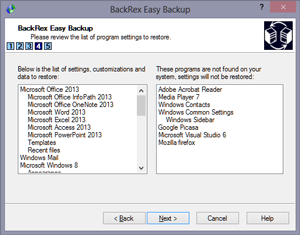 BackRex Easy Backup can help you transfer all your settings and customizations from one computer to another, even if different version of Windows is installed on another machine (e.g. Windows XP and Windows Vista systems). BackRex Easy Backup has a command-line interface. You can use it to start backup and/or restore process unattended from any script or batch file. How to use BackRex Easy Backup? Run BackRex Easy Backup on the computer which settings and/or profile(s) you want to save, then choose Backup option in the program, and finally select a folder to save all collected data in. After BackRex Easy Backup finishes processing data, keep the results in a safe place – you will need them to restore your settings, profile(s) and customizations. To restore your data, start BackRex Easy Backup, select a folder, created during the backup process, and all your settings, customizations and profile(s) will be restored within several minutes. Just reboot your computer to complete the restore process. Easy, isn’t it? Windows XP/Vista/7/8 and Microsoft Office XP/2003/2007/2010/2013 are supported. Optional compression of backed up data. Migrating between different versions of Windows and Office. Ability to roll back restore operation. Does not migrate between different versions of Windows operating system. You will only be able to backup and restore data on the same version of Windows. Does not restore Microsoft Office settings. Restores Outlook Express mail folders and preferences partially. BackRex Easy Backup can be ordered worldwide. Click here to order now. For immediate delivery choose online order option. You will receive download instructions in just a few minutes after placing an online order, 24 hours a day, 7 days a week.